Elite Strength Coaches & Personal Trainers. Transforming boys & girls into faster, stronger and more powerful athletes, and Training active adults to safely and effectively get in the best shape of their lives. Lacrosse skills Girls will train with Laxachusetts and Braintree HS Coach Taylor Clancy. Boys will train with Laxachusetts Coach Cam Joyce. Speed coaching with Brendan Shea. 6th graders will learn the mechanics of sprinting, defending, changing directions on a dime, and covering the whole field faster. We will also work on flexibility, nutrition, and body weight strength exercises to get them as fast as possible. Training over the in September will be on Tuesdays and Thursdays from 4:00-5:00 pm, starting on Thursday September 13. Heart Rate Cardio Strength Training uses the same heart rate monitoring technology as and spinning and cycling studios as well as OTF, while top-notch strength coaches put you through a challenging program that is somehow safe and fun. Designed to get you stronger while making your body healthier, you will be working in a group of 6-10 adults for one hour. Burn calories, boost your metabolism 24/7, get more energy, and feel great! Each session we work on flexibility, cardio, strength training, burning calories while building your body up! There's so much you can do with it! Plan and schedule your classes. View schedule, special sales, buy more visits & see how many passes you have left on your account. 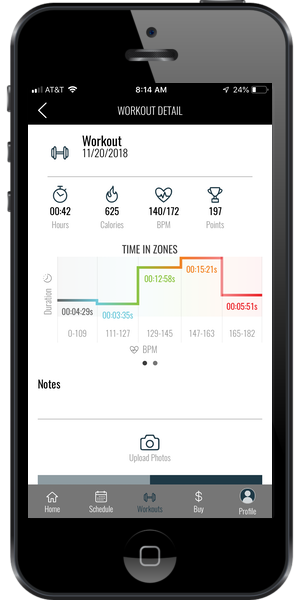 Track your workouts using our heart rate monitor. Now you can see how many miles you've run, calories burned, and the stats from all of your workouts: in our gym OR at home.